Hello, welcome to my custom shop. I specialize in making unique facial makeup and skin themes. My textures are made in GIMP using a mouse. 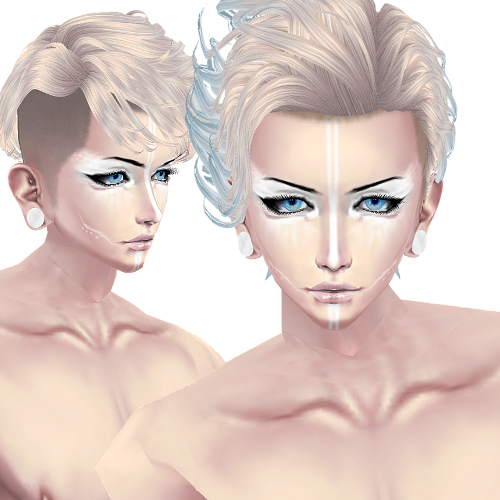 The purpose of this shop is to make custom products intended for wearing uses in IMVU client only. Please make sure you do not violate IMVU TOS when ordering from me. - Please have patience, I have a busy schedule. Allow me up to 2 weeks to complete your order. - Wait to send payment until you are satisfied with your product preview. - Be reasonable/realistic when ordering, not everything is possible. I will try my best. - All product previews will be posted in this shop unless you request otherwise. - If you wish to have certain products (such as heads) in your preview, please link it. - If you do not respond to your product preview within 2 weeks it will be submitted for public purchase. Limited products - PYP (Pick your price), your product will be listed in the catalog as twice the amount you paid. Display Only products - Reserved for trades of goods only. Message me privately for details. I only accept credits as payment for these services. If you need a sticker to make payment, please mention when ordering. Also feel free to link any references you wish. If you have any questions/concerns feel free to PM my inbox or post here. I will do my best to take care of any issues. Nice job Lex! I'm thinking about a custom pet..
Wow, it's nice seeing actual skin makers and not just those who buy TGM skins. ;p Very nice work you do there. Details: Eyeshadow Simple purple tinted lips Sorry for linking this but I like this tone. Just to be sure, your skin is female or male? Oh! I wanted a female skin, sorry! Hey, starting on your order this weekend! Sorry for that wait! Hey Mairo, is this correct? Oh, lord I love it, sent payment . Don't forget that you can put it for public. Details: Skintone and upper body markings. Abs. Eye makeup sorta like this skin of yours. Additional information: Overall markings. Basicly I really want to have a skin for a human version of this character. Name your product: Sitri skin. Just to be sure, you want the skin to be pale like the reference? Hey, is this correct for you? Additional information: Have fun with it! TYT with it. Name your product: Up to you. Hey, how is this for you?